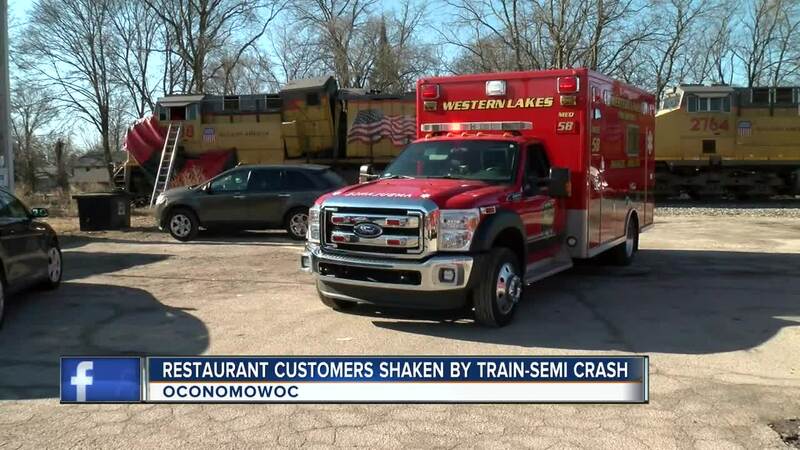 OCONOMOWOC — A Union Pacific train collided with a semi-truck on Oconomowoc's Main Street on Friday morning, the police chief said. "We received numerous 911 calls around 8:15 this morning," Chief Ron Buerger of the Oconomowoc Police Department said. "Our initial investigation, which is ongoing, is that the semi was attempting to turn right from South Main Street onto 2nd Street. It got hung up on the median island and tried to navigate the island and back up. At which time, the train came through and split the trailer in half." Nobody was seriously hurt in the crash. Six people were assessed, including the driver of the semi who was taken to a local hospital as a precaution. Buerger said he was cleared, so there were no injuries as a result of the crash. However, it was an extremely dangerous situation. 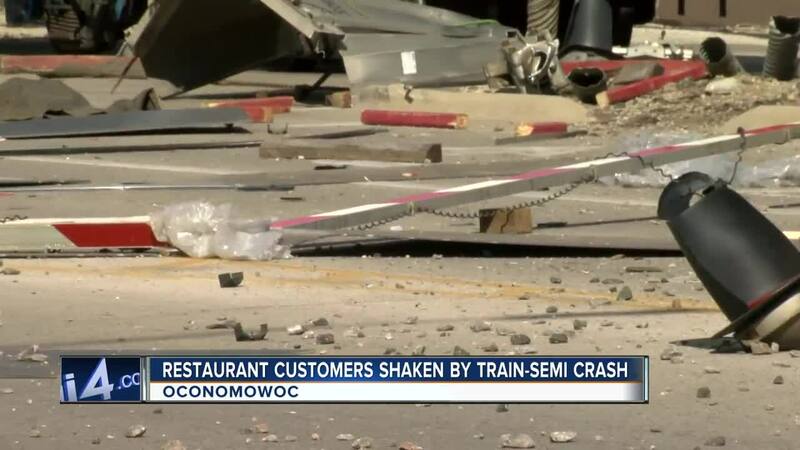 Not only did the crash happen in a densely populated area of Oconomowoc, outside of Maxim's Restaurant, but the vehicle had a large load of flammable material. Fire officials say it is denatured alcohol. "My understanding is it's 95 cars of flammable material," Buerger said. "There was no derailment, no leakage, and the last I heard, CP rail was inspecting the tracks and no damage done to the tracks. It could have been very severe. We're very fortunate today." Inside Maxim's, there were more than a dozen people enjoying their Friday morning breakfast; all of whom had front-row seats to the action, just feet from the rails. "It was the most terrifying experience ever," said Kyla Zarcoaparicio, a waitress at the restaurant. "I've never faced a near death, and it's crazy how things can happen in a matter of a second." The restaurant is an old train depot that shut down in the 1970s. Almost daily, people inside can enjoy a meal while watching trains go by. The tracks are so close, customers can feel their table rattle as they go by. That novelty became too much of a reality Friday morning. "I heard this horrible noise that lasted probably five minutes," said Sue Thelen, manager of Maxim's. "I never heard anything like it before. I don't know what a bomb sounds like when it goes off, but to me, that's what it sounded like. It was terrifying. You don't know, anything could happen today." "All you could hear is the horns blaring and blaring," Zarcoaparicio said. "Then you heard the whack and the building shook. I was running that way. It was almost coming off the tracks. I was beelining for the door." The flatbed was destroyed, sending debris all over the road and splitting it in two. The debris and rocks kicked up and broke the outside panes of glass on some of the windows at Maxim's. "They were screaming," Zarcoaparicio said. "I had a customer push someone out of a booth to save his life. All the other customers were cowering down and sliding into the middle of the aisles to get away. I was shaking a little bit, crying a little bit. I'm OK now." Buerger said they continue to investigate and haven't given any citations to anyone yet. He expects the area to be clear and the train to be moved by midafternoon Friday, so all of the intersections will be open. However, the intersection at Main and Summit will likely be closed for the weekend as crews replace the crossing signal destroyed in the crash.